Microscopic polyangiitis is a pauci-immune necrotizing small- and medium-vessel vasculitis mainly involving the lung and kidneys but also the peripheral nerves and skin. A variety of skin lesions are observed in about half of patients. 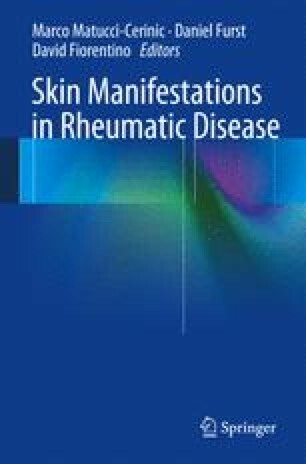 The most common cutaneous manifestations are palpable purpura, livedo racemosa, and skin nodules. Histology of skin lesions typically shows leukocytoclasia with fibrinoid degeneration, neutrophil infiltration, and sometimes erythrocyte extravasation around the affected capillaries and small vessels in the dermis. Direct immunofluorescence shows absence of immunoglobulin deposits. A detailed clinical history and physical examination complemented by histological studies can aid in discriminating microscopic polyangiitis from other vasculitides affecting the skin.